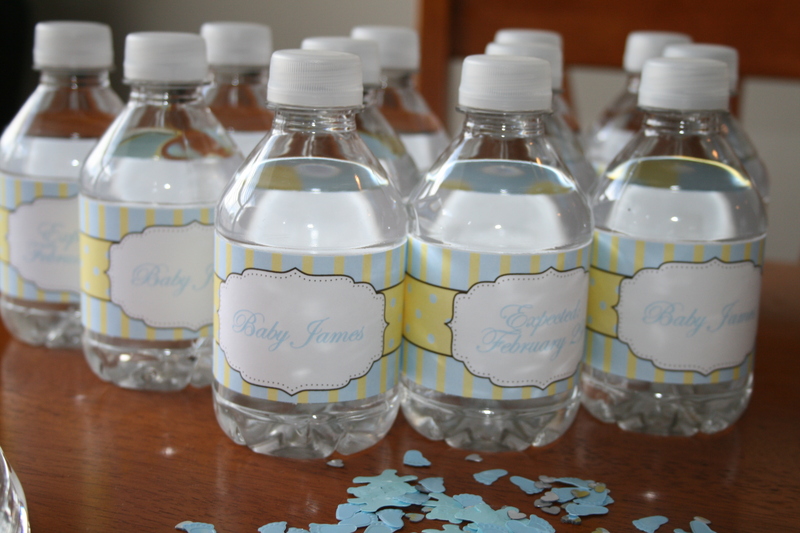 Personalized water bottle labels is a quick and easy way to personalize any event. 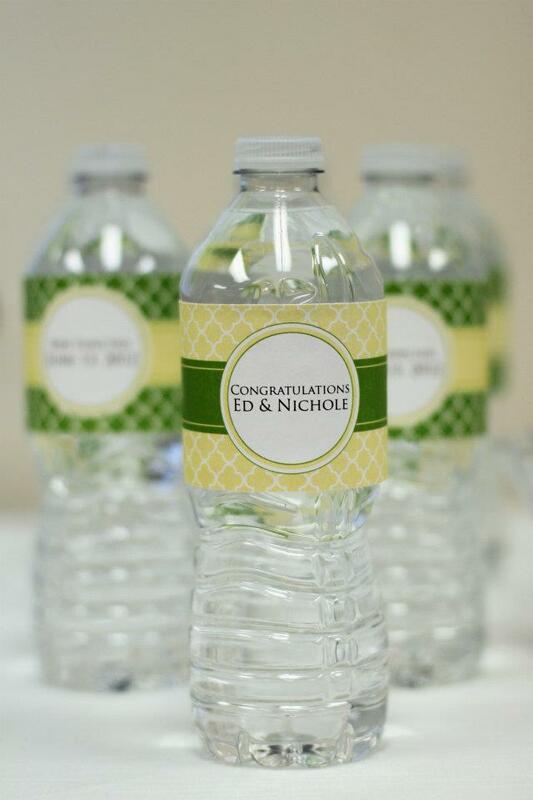 I have a whole bunch of water bottle wrappers in my Etsy store but today I wanted to share these in purple and green because my lovely client sent me photos from the shower she hosted. What do you think? The purple and green look really preppy, don’t you think? I also like that this color combo could be used for a baby girl, a baby boy or twins! 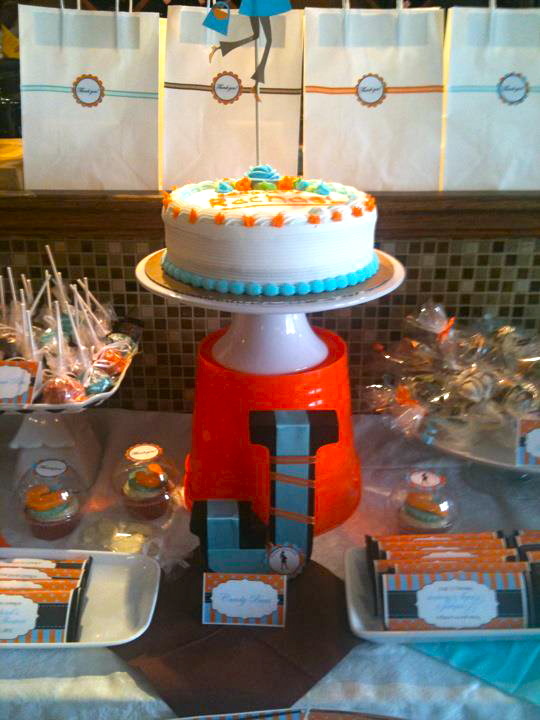 What is your favourite color combination for a baby shower? I also have some damask purple and green water bottle wrappers available if you prefer that print to the stripes and damask and of course some super cute Hershey kiss stickers, too! 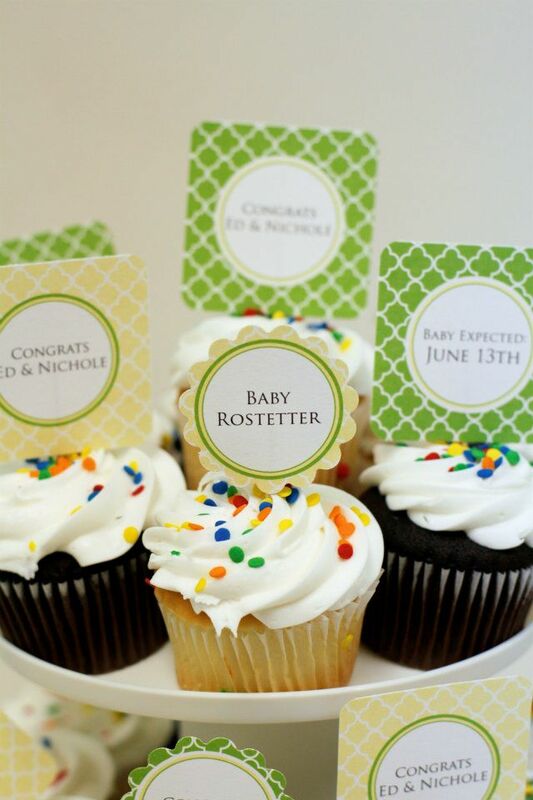 If you need more inspiration and baby shower ideas you can check out my boards on Pinterest for a girl and for a boy. 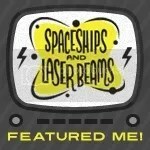 Also, don’t forget to like my Facebook page and follow me on Twitter! I am sooooo excited to share these photos with you today because I designed this Little Kokeshi collection with my daughter’s upcoming 6th birthday in mind. Only a day after posting the items in my Etsy store, Ritz contacted me to see if I could adapt the text to make the printable appropriate for a baby shower. 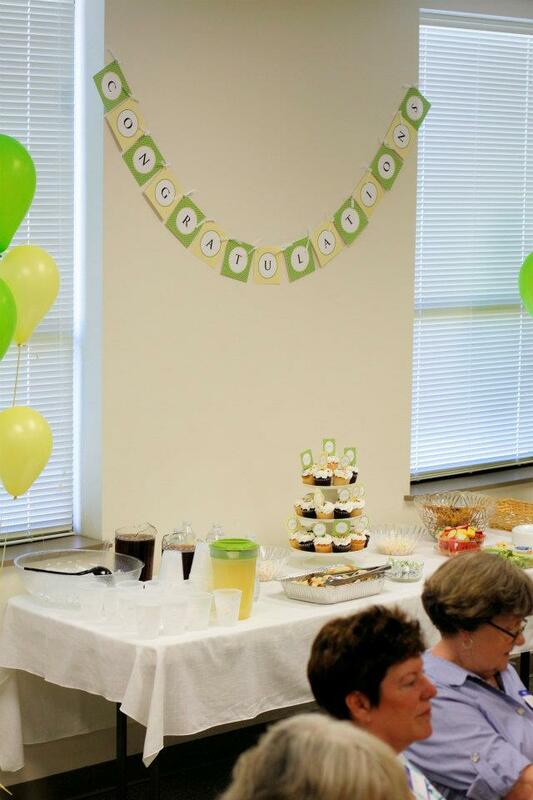 Of course, I was more than happy to oblige and I was blown away when she sent me photos from the baby shower. 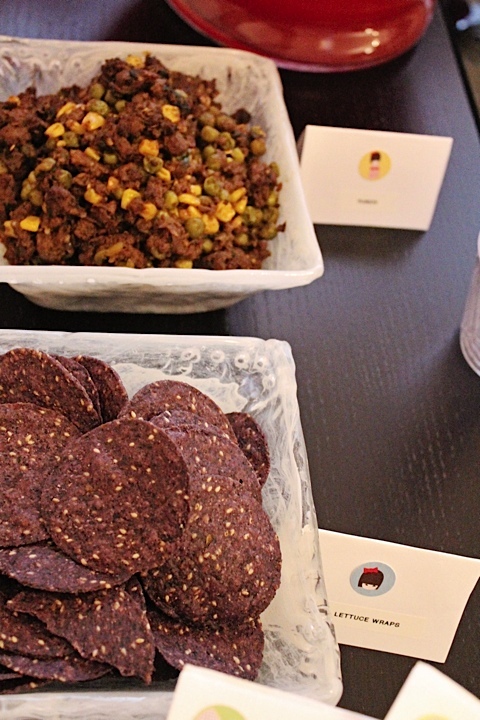 She used the Hershey kiss labels to personalize the napkins (great idea, by the way) as well as the food labels. 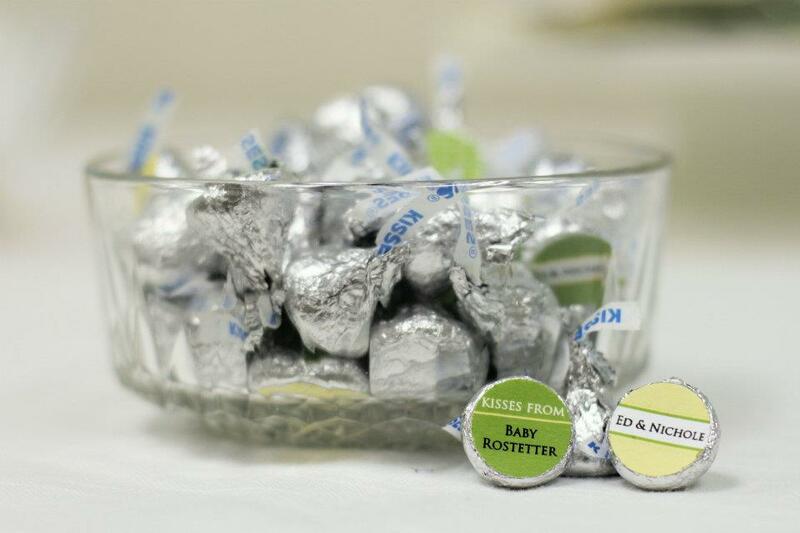 She also gave out personalized Hershey kisses as party favors. 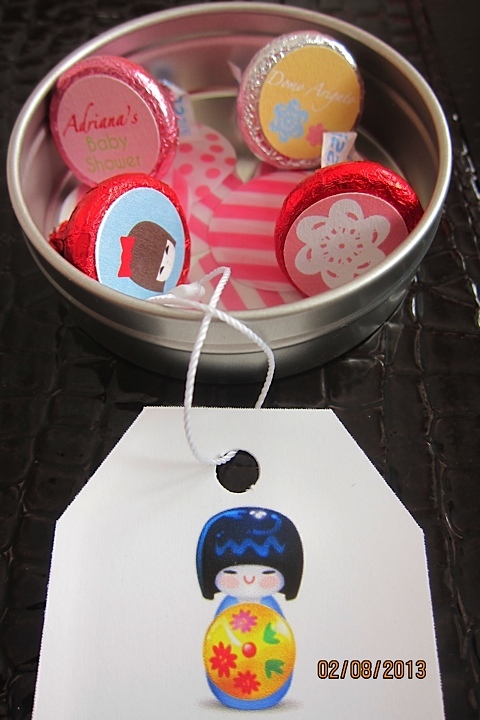 She placed these inside gorgeous Japanese tins which she purchased off Etsy from Gami Works. 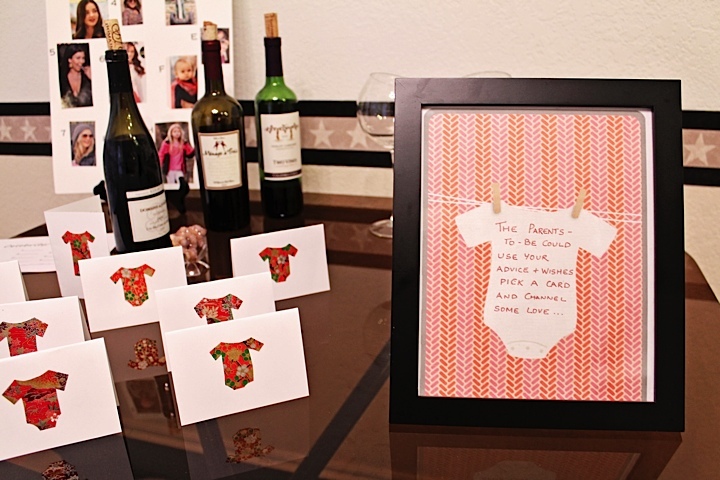 I also love the onesies that Ritz made out of origami paper and used as comment/wishes cards. 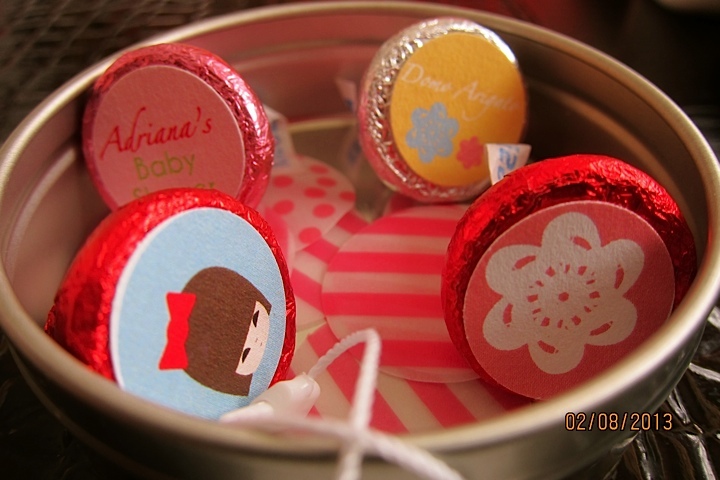 These were placed inside the Hello Kitty pockets of the table backdrop. And of course, the Little Kokeshi banner is totally adorable! Don’t you think Ritz did an amazing job with all the details and the love that she put into the shower? I’m sure that the mommy-to-be, Adriana was touched, too. 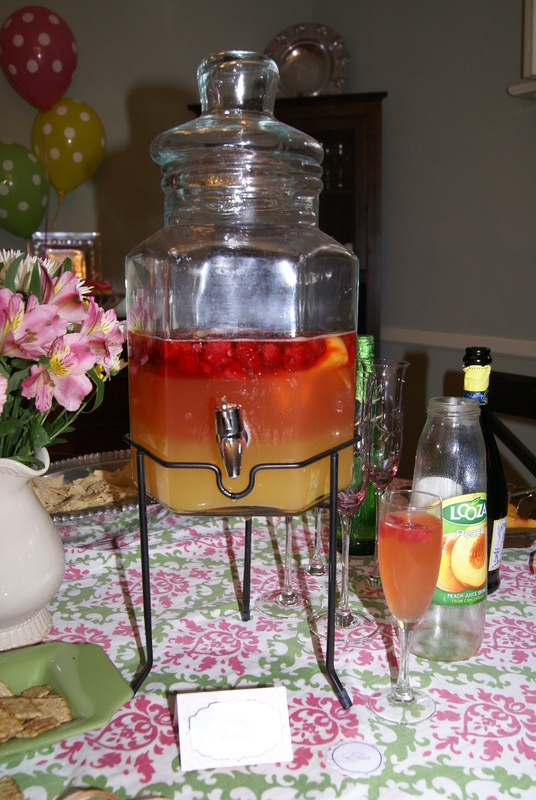 Looking at these photos makes me even more excited for my daughter’s party this summer! I love this theme and think it is totally adorable. 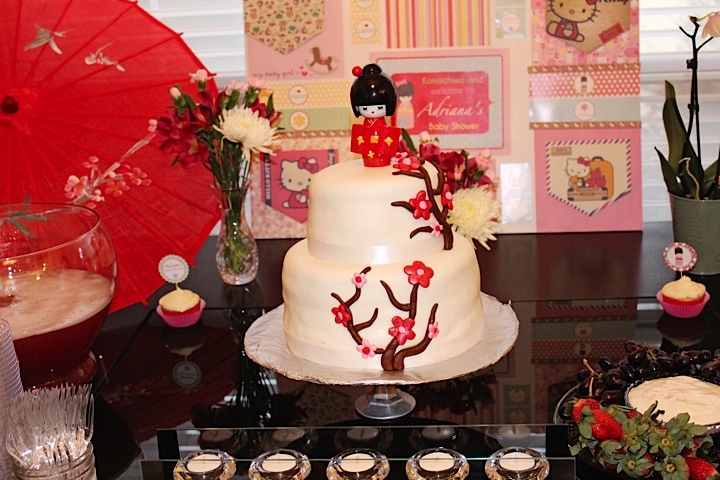 Thank you so much Ritz for sharing photos from Adriana’s shower! 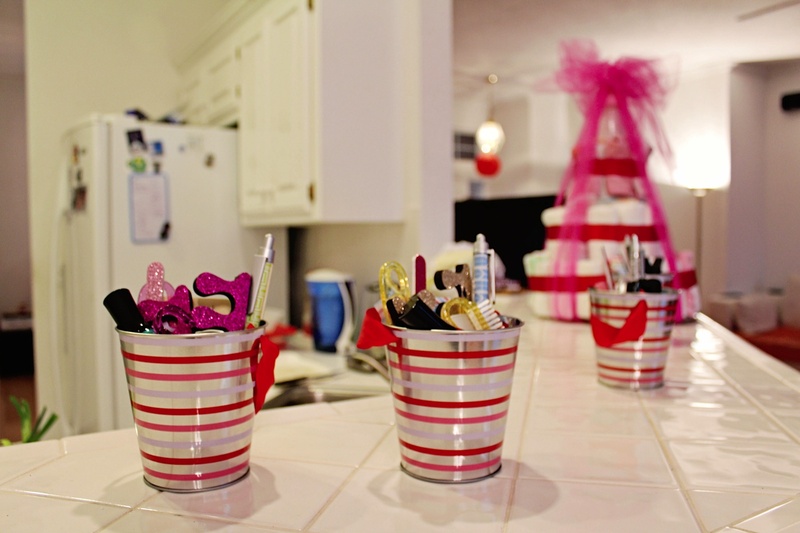 I am so happy to be working with you again for your son’s upcoming birthday party. 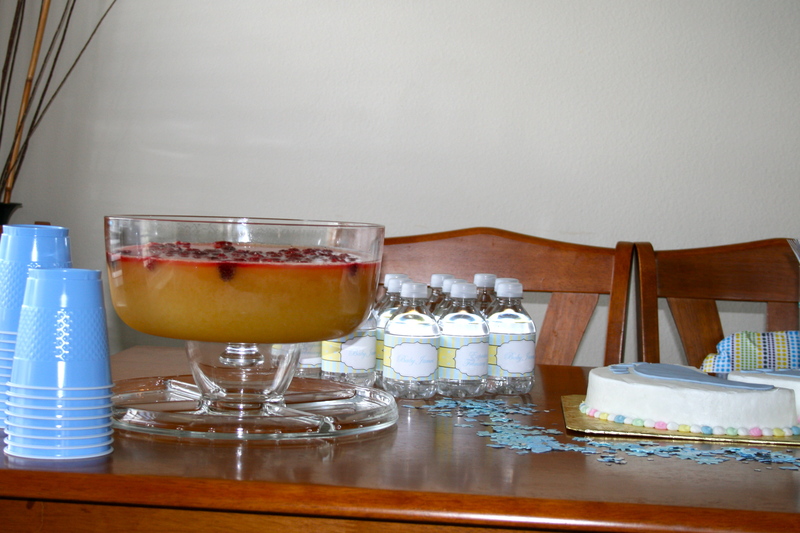 Today I have photos from a baby shower to share with you. The shower was back in May. It’s been a busy summer so I apologize for taking so long to post these photos. 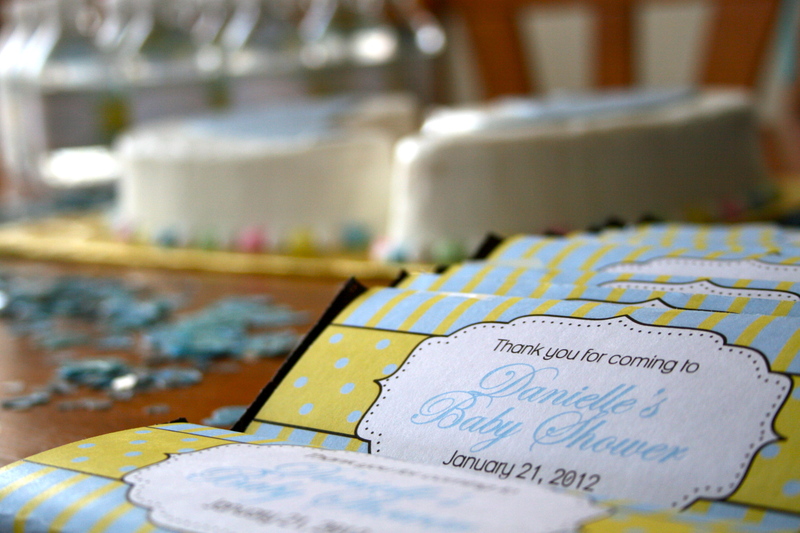 Danielle of All Things Great and Small Photography asked me to design printables for a gender neutral baby shower. 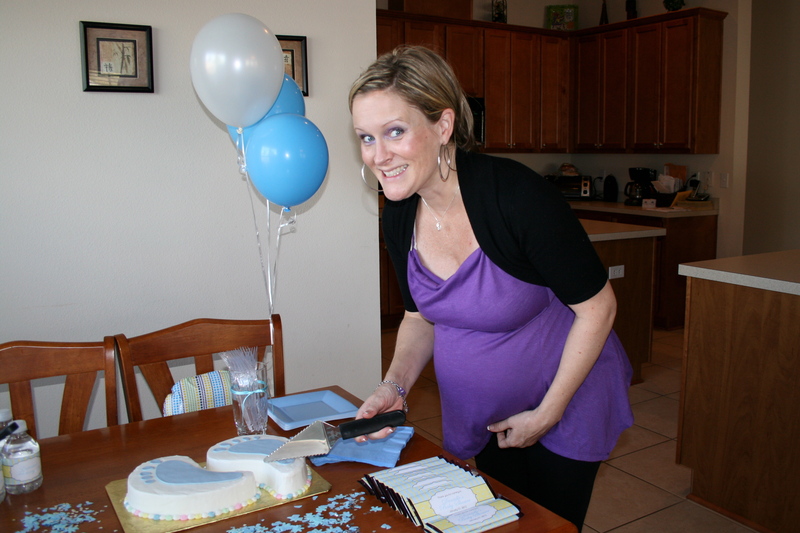 A couple at her church, Ed and Nichole were expecting their first baby and did not know the gender of the baby. So, Danielle wanted something that was sweet and pretty yet not girly or boyish. 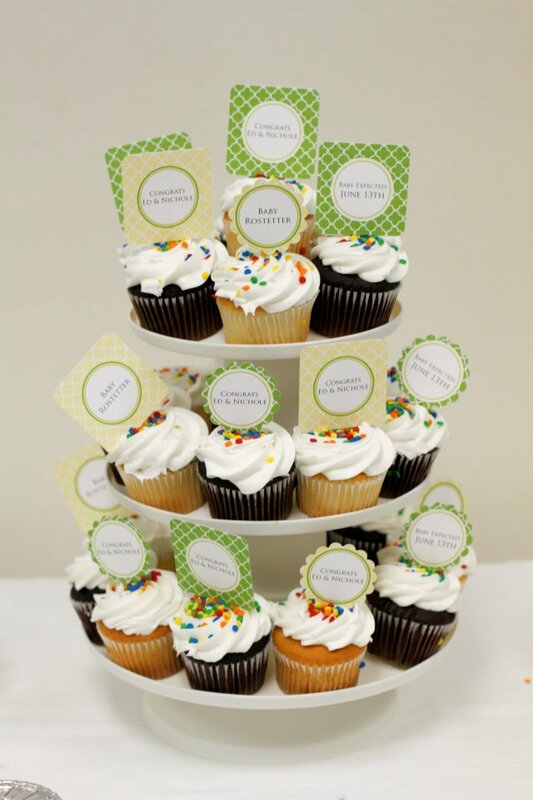 Since the shower was in the Spring, she choose a green and buttercream color scheme. Danielle requested a couple custom items- a banner that read CONGRATULATIONS and labels for Hershey kiss chocolates so I will get these listed in the store as soon as possible to make those items available for purchase. 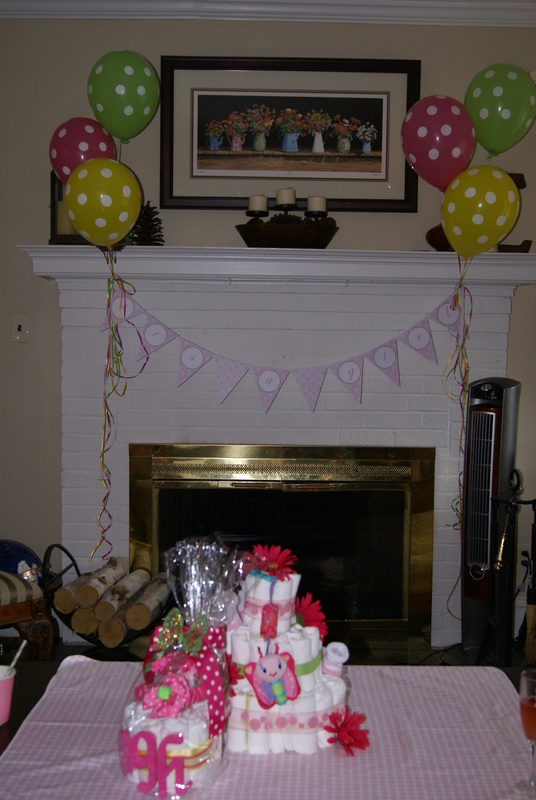 Thank you Danielle for sharing photos from the baby shower and congratulations to Ed and Nichole on the birth of your beautiful daughter, Eveylnn Elizabeth. Danielle is available for photo shoots in the Pensacola, Florida area. You can contact her via her Facebook page, e-mail her at Danielle@AllThingsGreatAndSmallPhotography.com or call her at 1 (850) 994-4508. 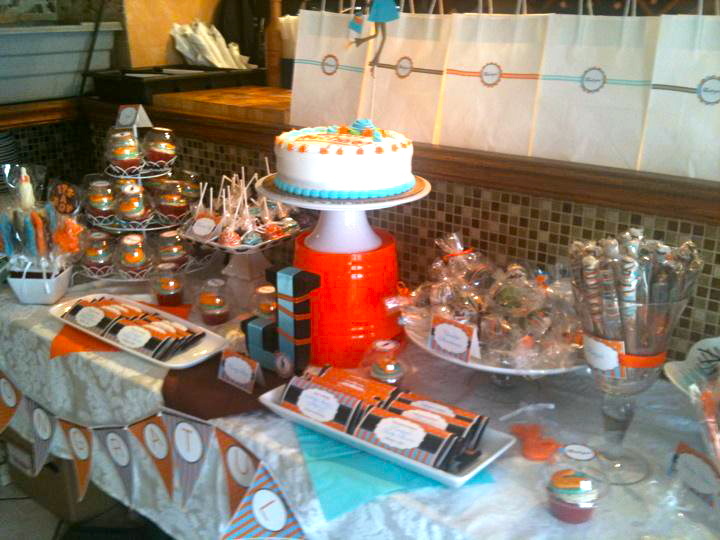 I had so much fun working with Nadine on this aqua and orange baby shower collection for her friend Rachael. Nadine had a clear idea of what she wanted from the moment she contacted me and I think she did an incredible job putting this shower together. 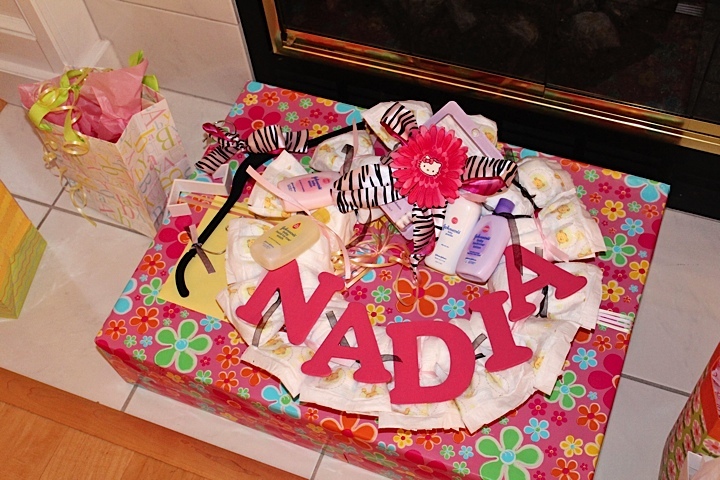 I love the bold colors, the whimsy of mixing stripes and polkadot but above all… Nadine’s attention to detail! 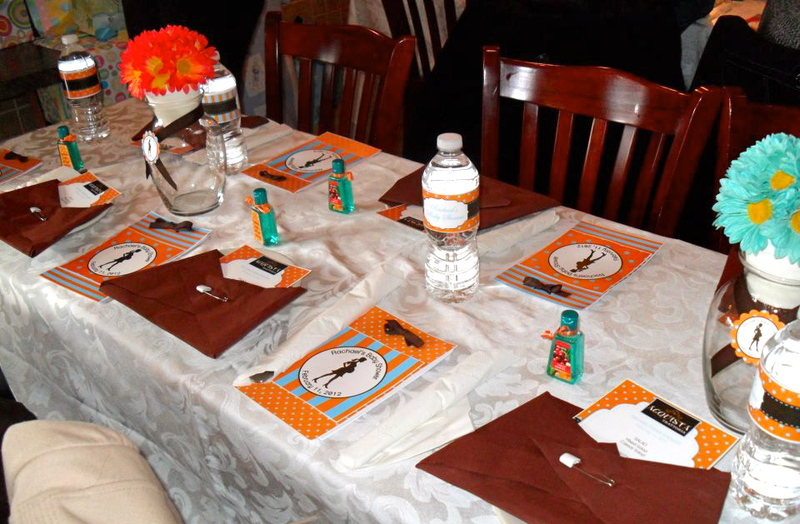 Even the napkins at each place setting look like cloth diapers! 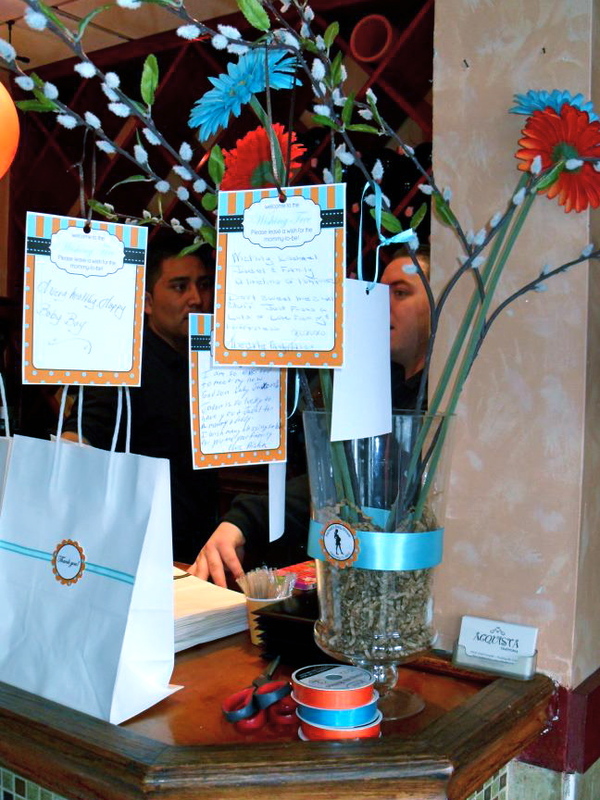 Don’t they look cute with the menu peeking out? 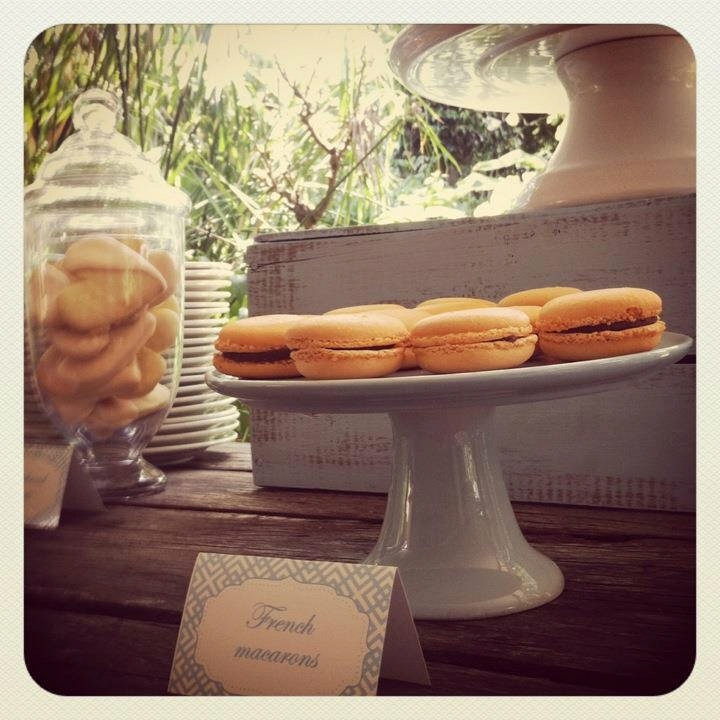 And how beautiful is her dessert table? The J wrapped in ribbon is so cute. 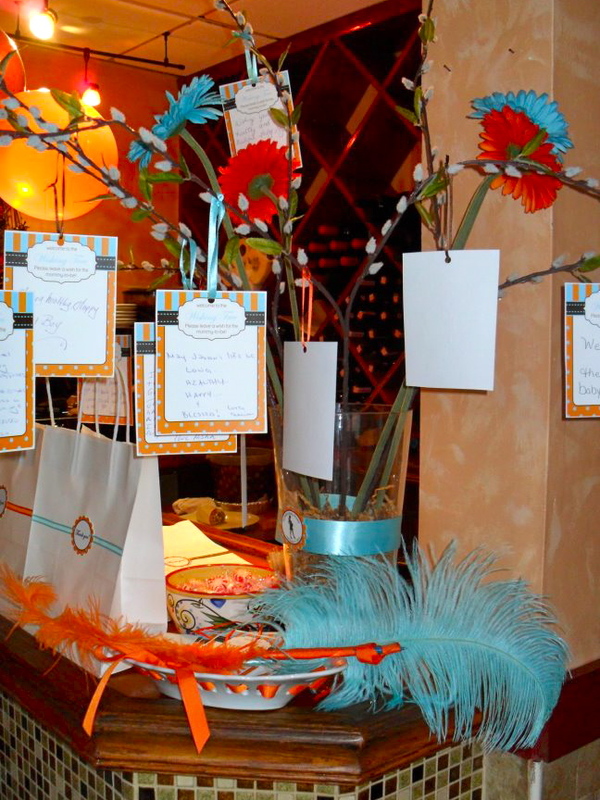 Nadine had cake pops, chocolate dipped pretzel rods (love those!!! 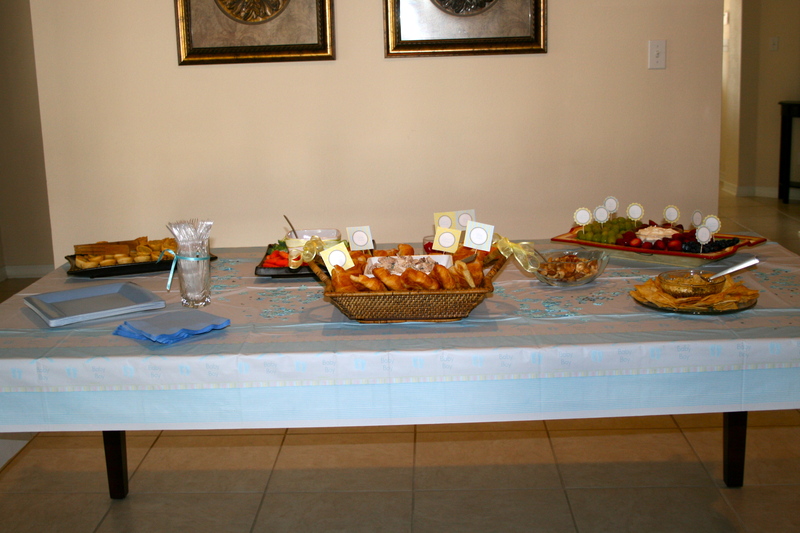 ), full sized Hershey chocolate bars, and individually packaged chocolate strawberries and cupcakes. Nadine requested wishing tree notecards. Have you seen those before? These cards are an adorable idea! 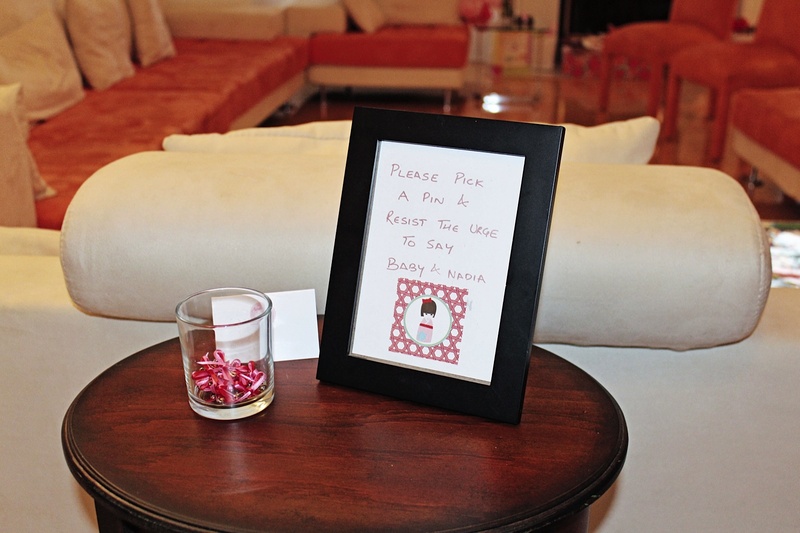 Guests wrote a special message to the mommy-to-be or the baby. These were hung using ribbon on a vase of floral branches and then saved for the mommy to read later. I thought that was such a sweet idea and a great keepsake. 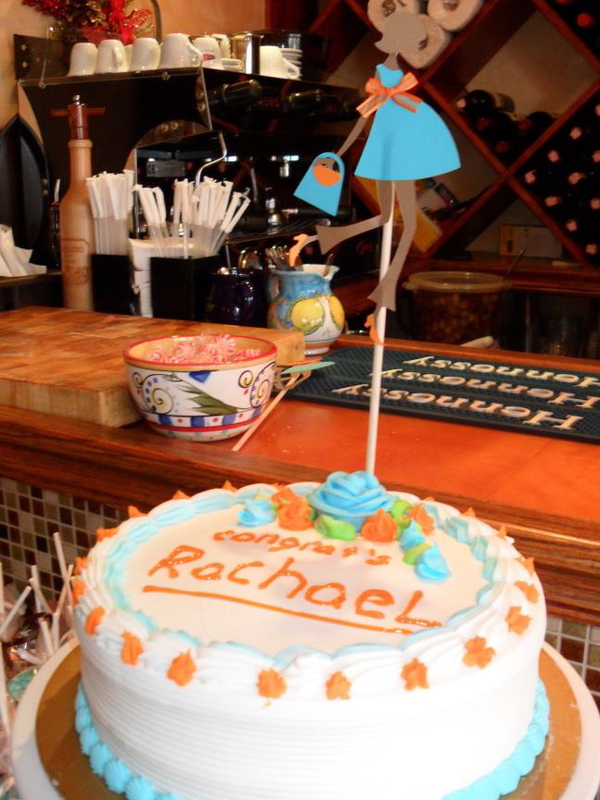 Nadine, thank you so much for sharing the photos from Rachael’s special day. I can tell that baby Jaxon will be surrounded by much love! 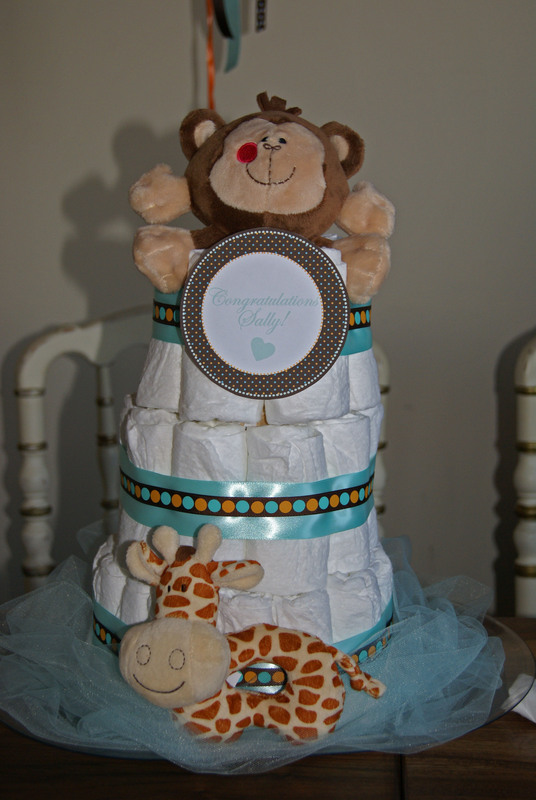 If you are throwing a baby shower and would like the above collection please contact me via e-mail at apartystudio@gmail.com or check out this listing in my Etsy store. 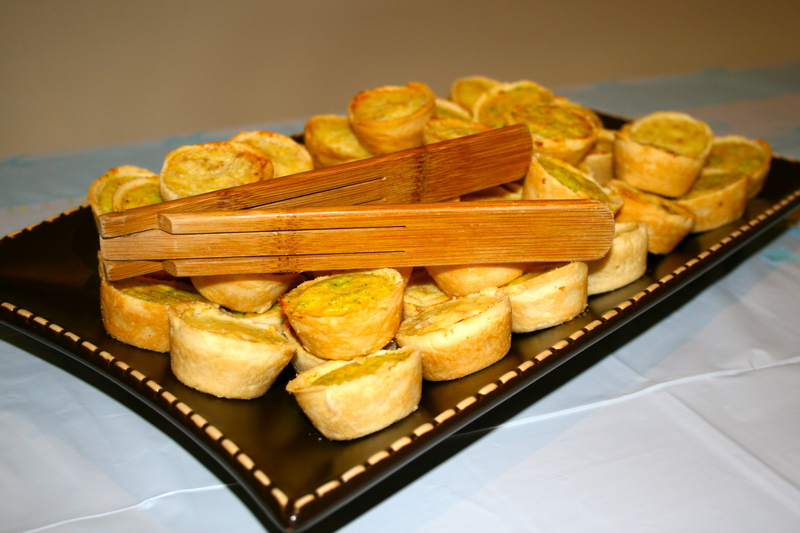 Don’t forget to like my Facebook page and follow me on Twitter and Pinterest! 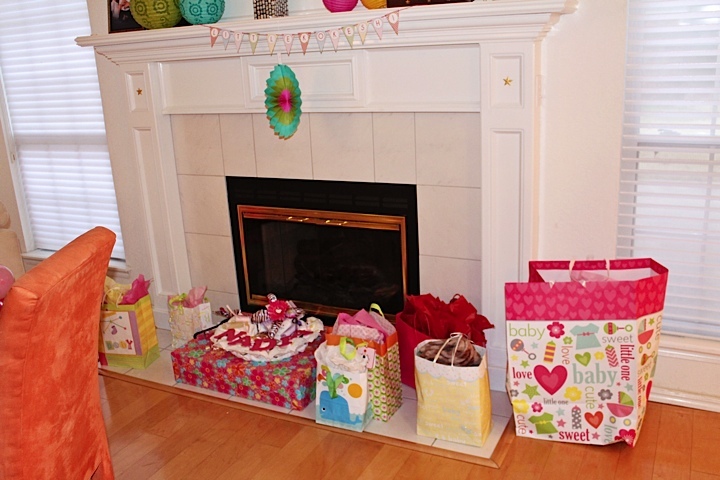 Today, I have photos to share with you from Danielle’s baby shower, held on Saturday. She is expecting her son, James, on February 29th. How exciting… a leap year baby! 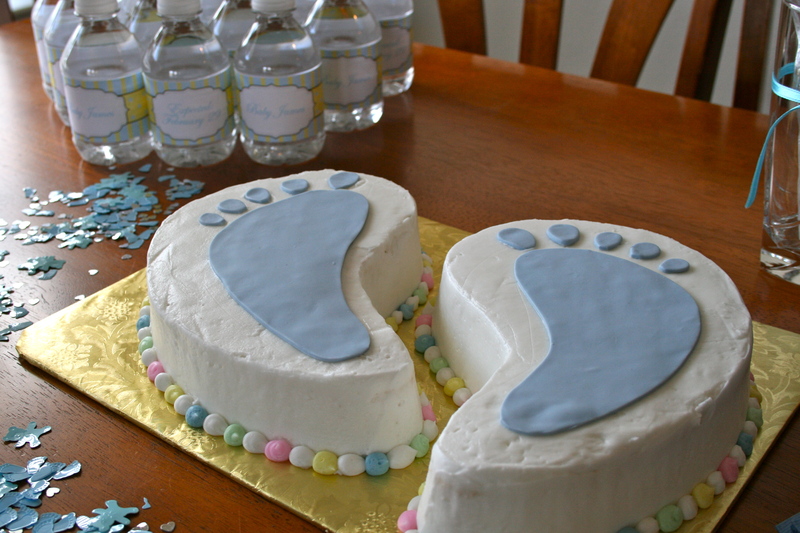 For her invites and cake, the shower host, Cheryl, used Wilton’s Baby Feet collection. 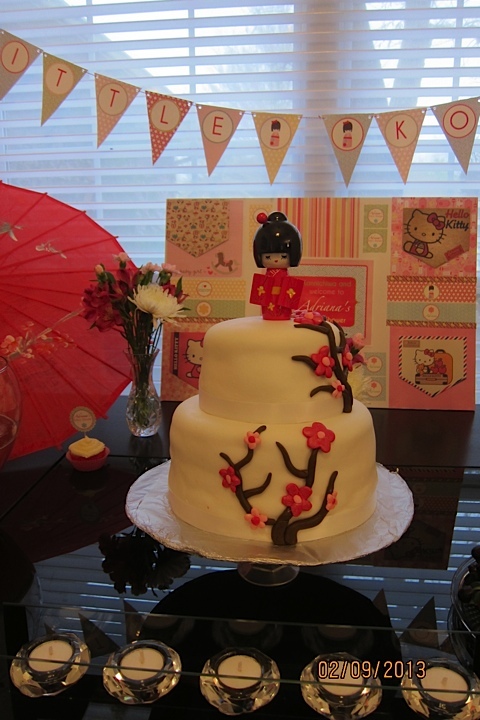 Look how adorable the cake came out! 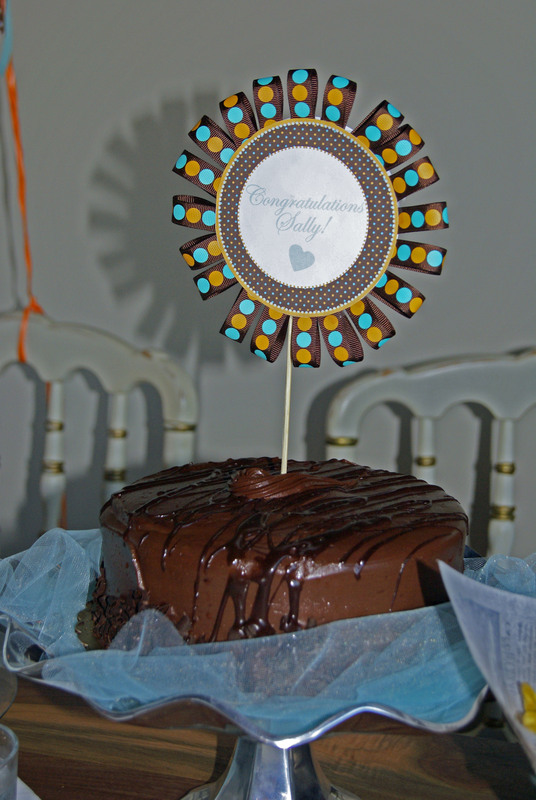 To compliment the cake, she choose light blue and buttercream yellow decorations. 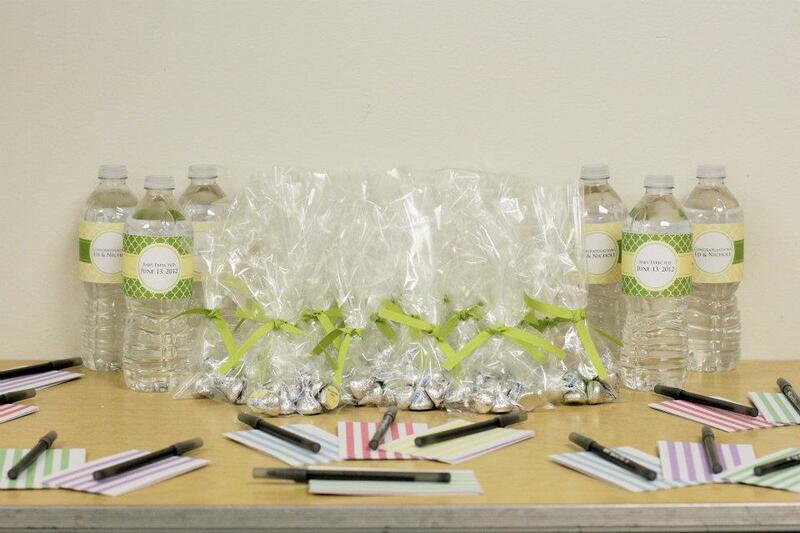 Check out the water bottle wrapper and the personalized chocolate bars! The water bottle wrappers have either the name of the baby or the due date. Both these items are now available in my Etsy store. 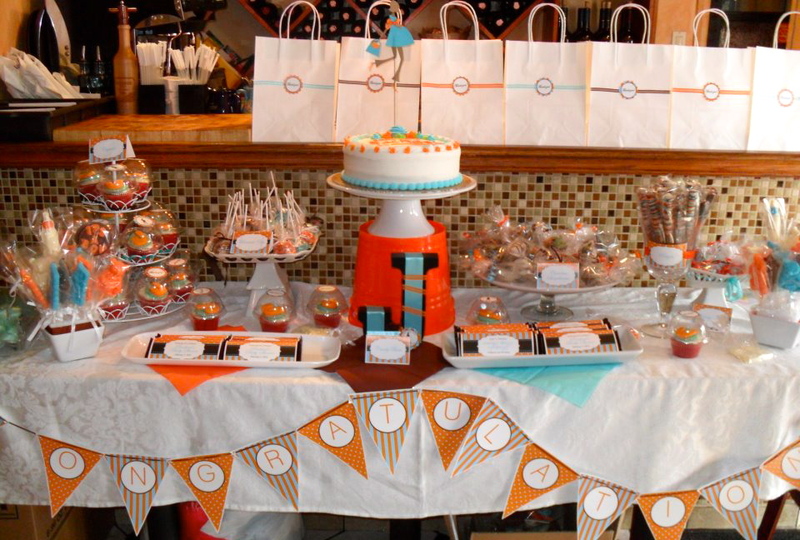 And if you are hosting a baby shower and love the stripes and polka dots, but need different colors, then please contact me because I am happy to customize the color on any of my party printables. 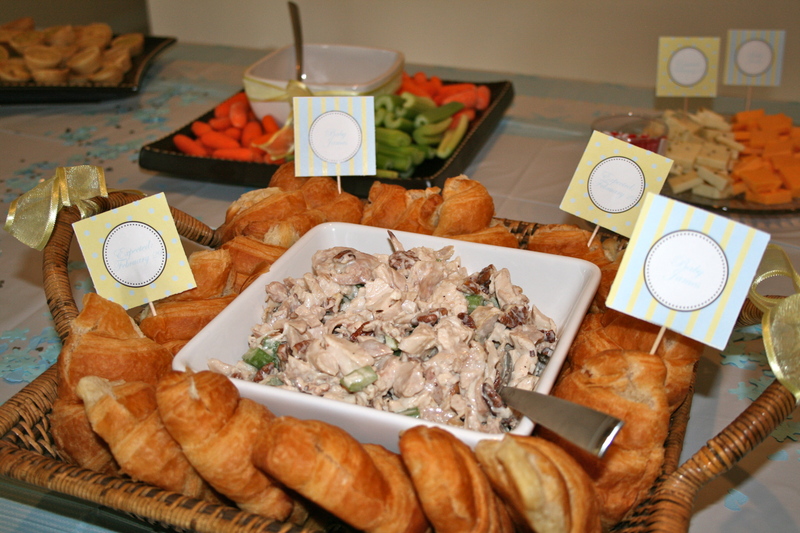 Food wise, Cheryl had a lovely classic brunch spread: chicken salad with fresh croissants, fruit with vanilla dip, gluten free bread with spinach dip, cheese and crackers, vegetables and dip, mini quiches, etc. 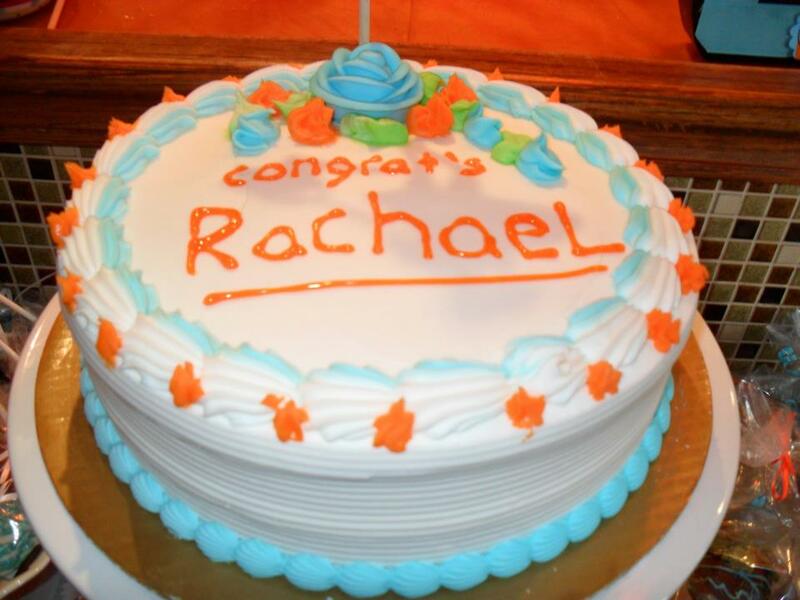 Congratulations Danielle and we look forward to meeting baby James very soon! 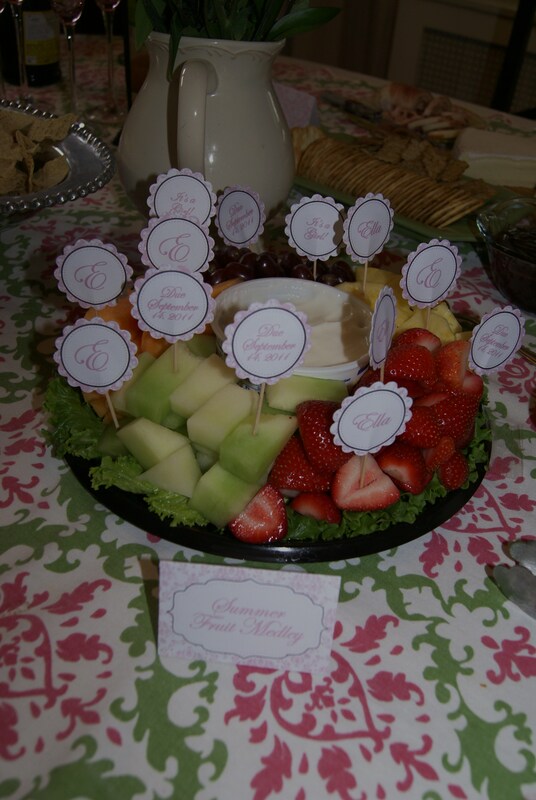 If you are planning a baby shower, then take a look at my two baby shower boards on Pinterest. 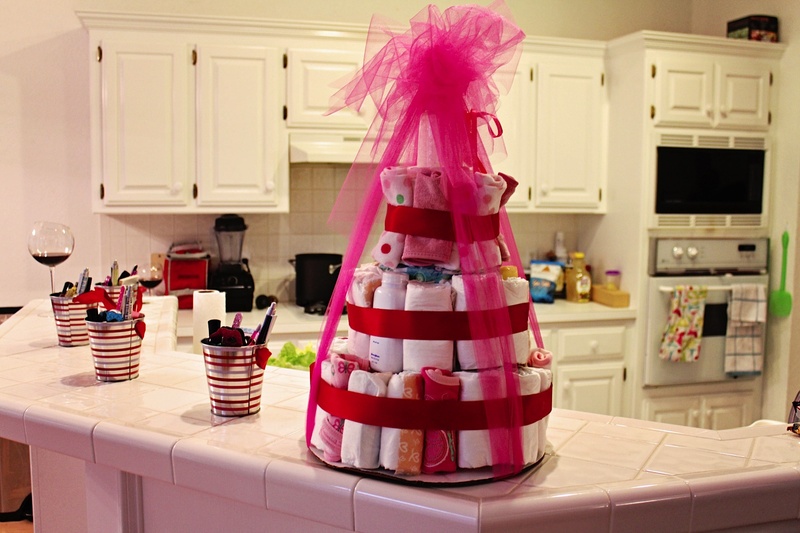 You may get some great ideas for your shower! 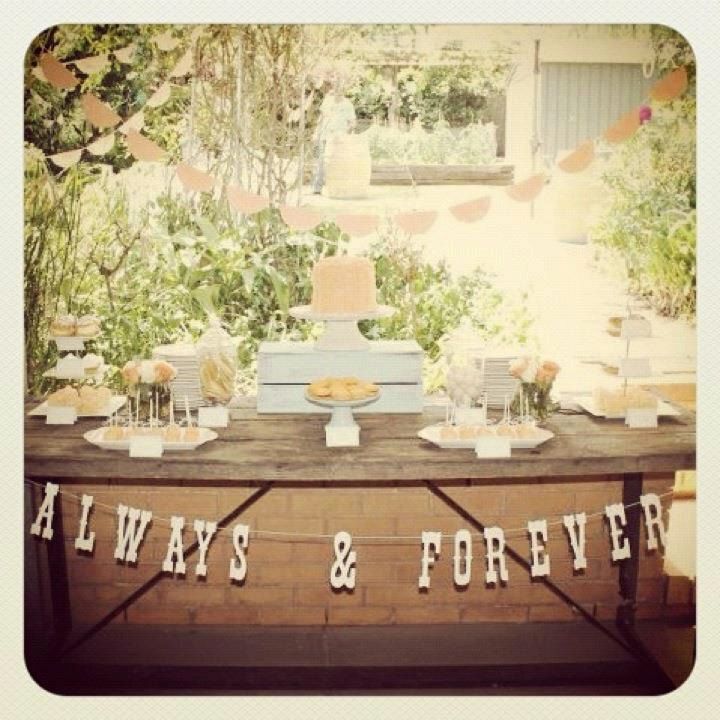 If you need anything custom made for your decorations or favors, please contact me at: apartystudio@gmail.com and don’t forget to like my Facebook page! 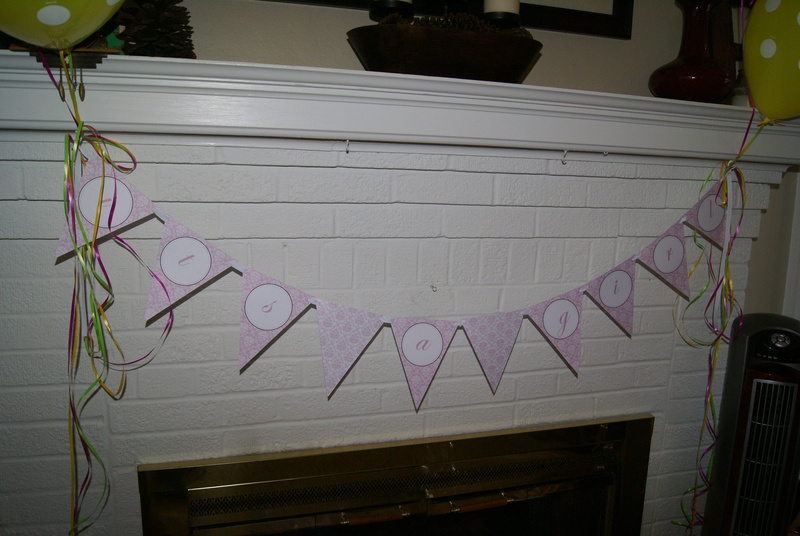 I can make banners, menu cards, food labels, 4 inch circles for the diaper cake, cupcake toppers, water bottle wrappers, etc. 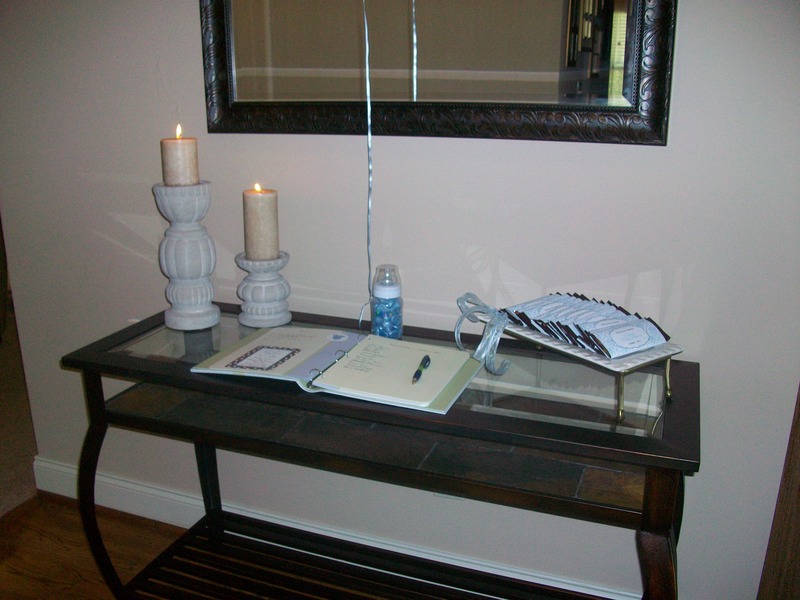 I love it when my clients send me photos and I get to share them with you all. 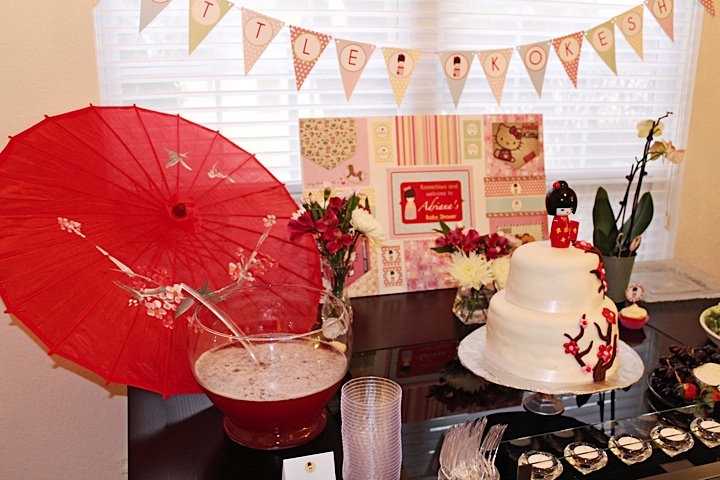 Thank you so much Bree for sending me these pics of the shabby chic bridal shower. Bree’s in Australia so early summer over there and lots of lovely lush greenery for a backdrop. Everything looks absolutely gorgeous! 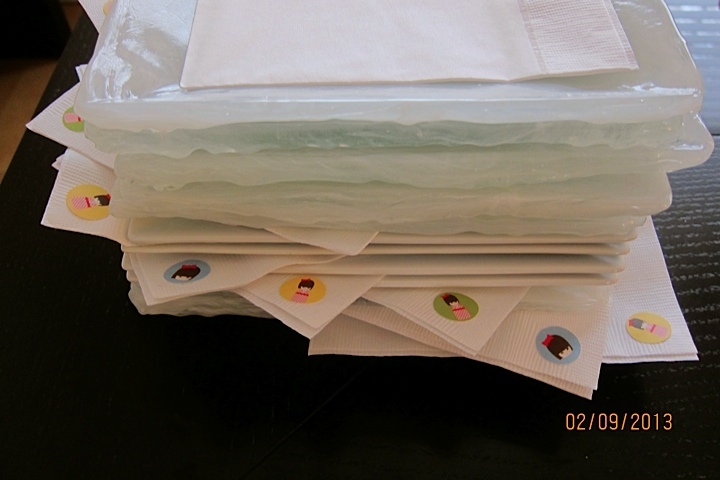 The blue and white labels that Bree used are available at my Etsy store right here. 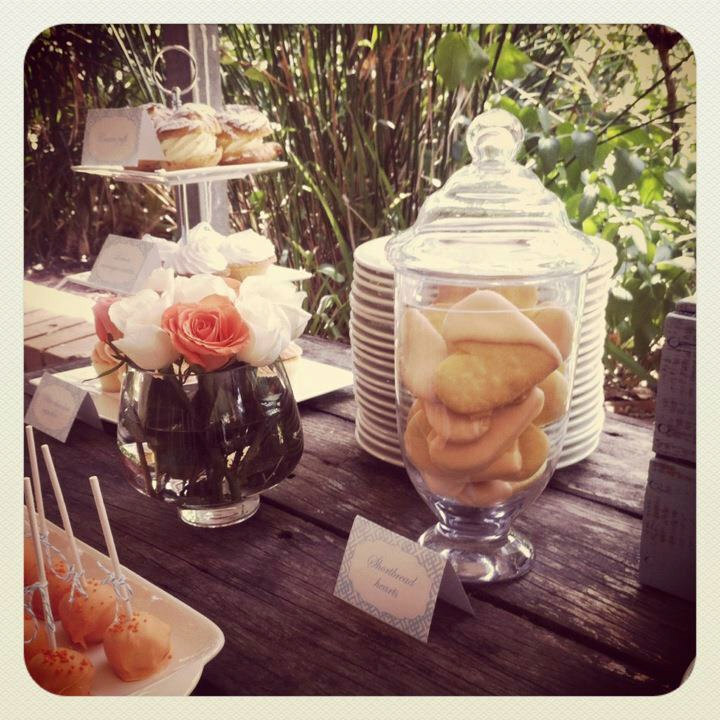 Don’t you just love the beautiful dessert table and especially the heart shaped shortbread cookies (in the 3rd picture)? Beautiful photos- thank you so much for sharing. 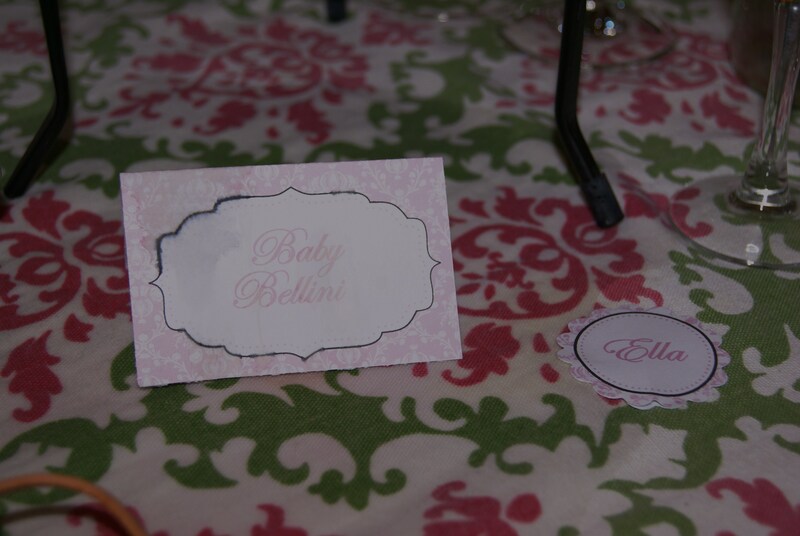 Also, don’t forget that I have FREE baby bingo game cards that match this set available at Catch My Party. 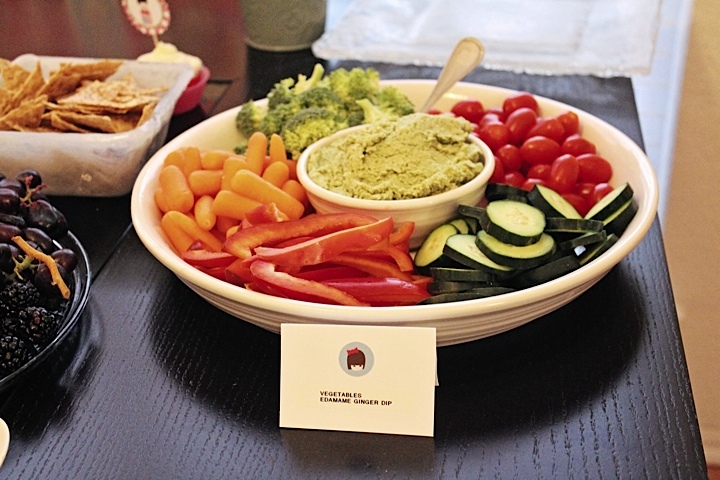 This makes a fun game for your baby shower. More party photos on my Facebook page or follow me on Twitter! Sorry the blog has been so quiet recently. I am currently in England… have taken a month to do some traveling with my family before my husband gets deployed for 9 weeks with his work. I will have my Etsy store up and running again in mid-November. In the meantime, I have some fun photos to share with you. 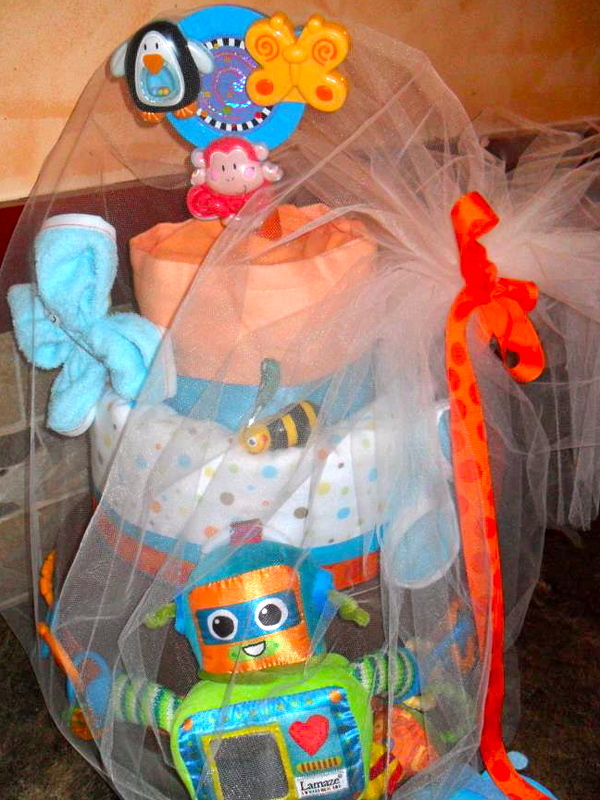 I was lucky enough to work on four baby showers in September and have received photos from three of these showers. I love it when clients share pictures. 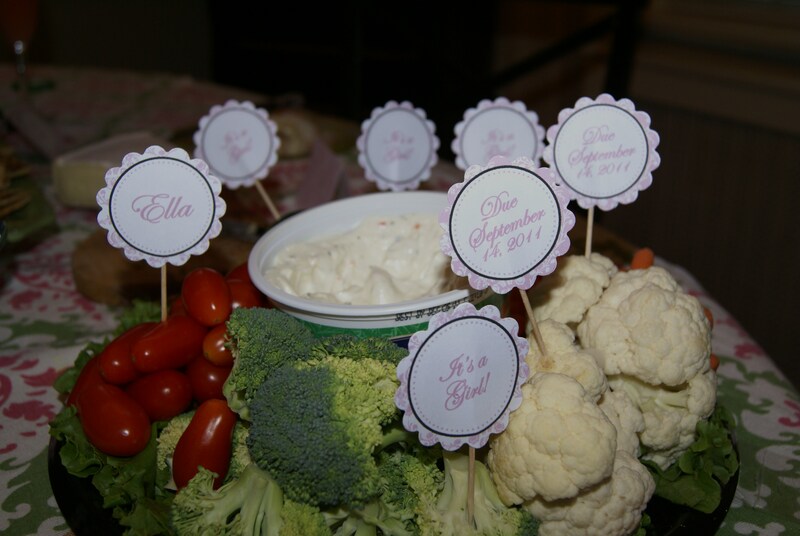 The first baby shower is for a baby girl… Ella. How pretty is that name? 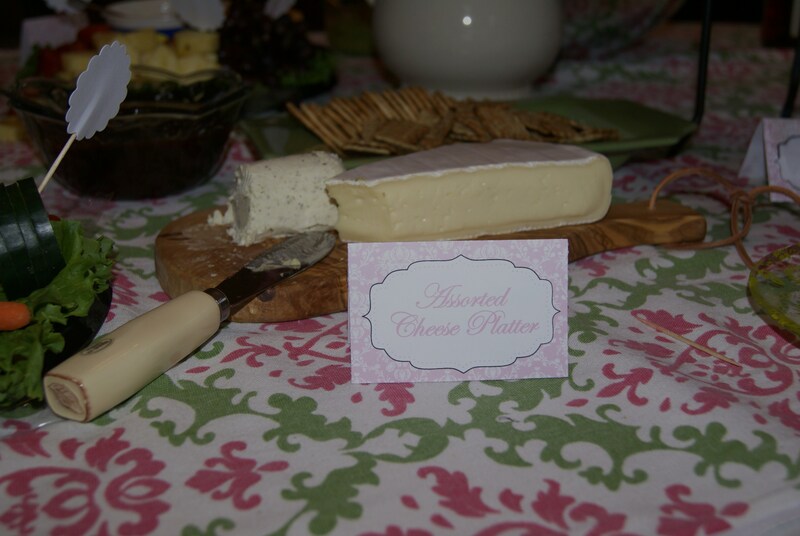 The printables featured soft pink and white damask print. 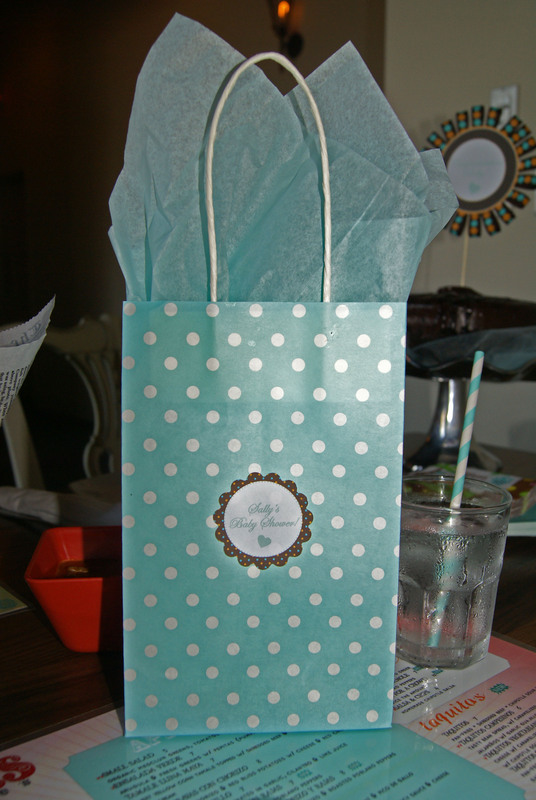 For the second shower, I was asked to turn the pink damask into blue for a boy shower. 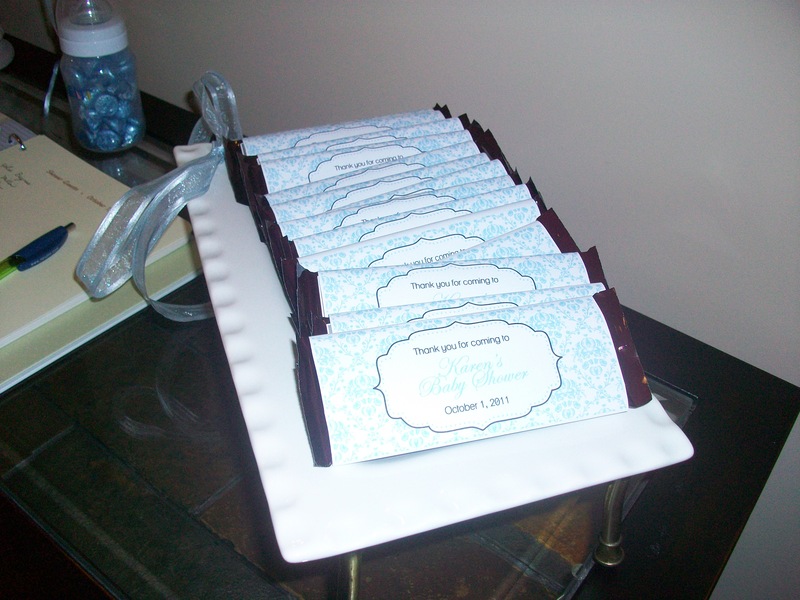 I love these chocolate bar wrappers. 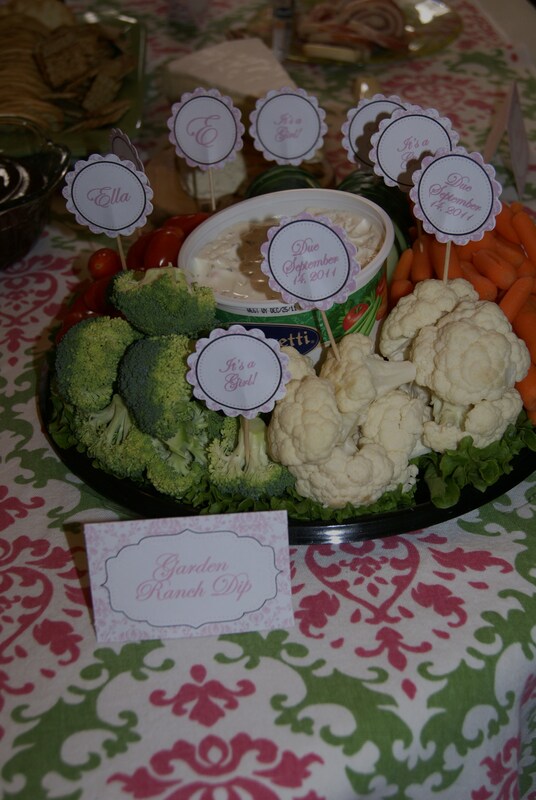 I think they make such lovely party favors. 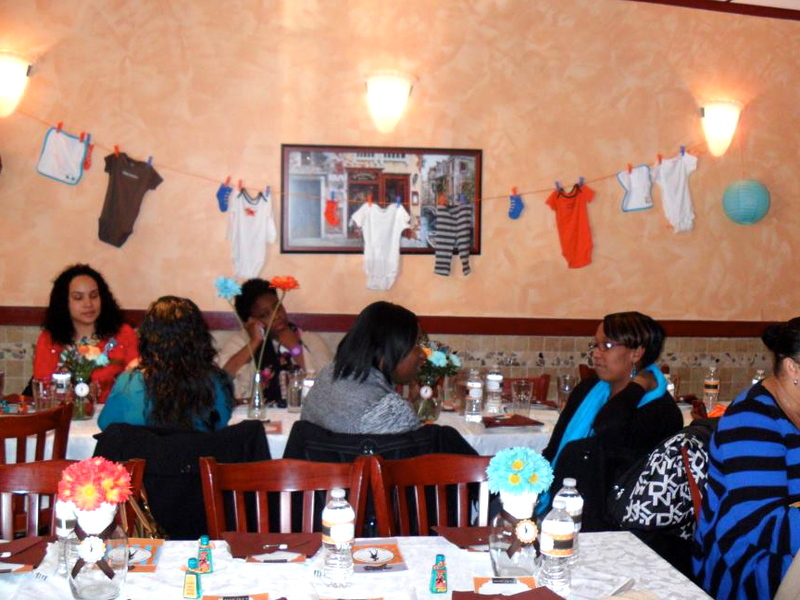 The next set of photos is for a baby shower held at a restaurant and the baby’s gender was being kept a surprise. 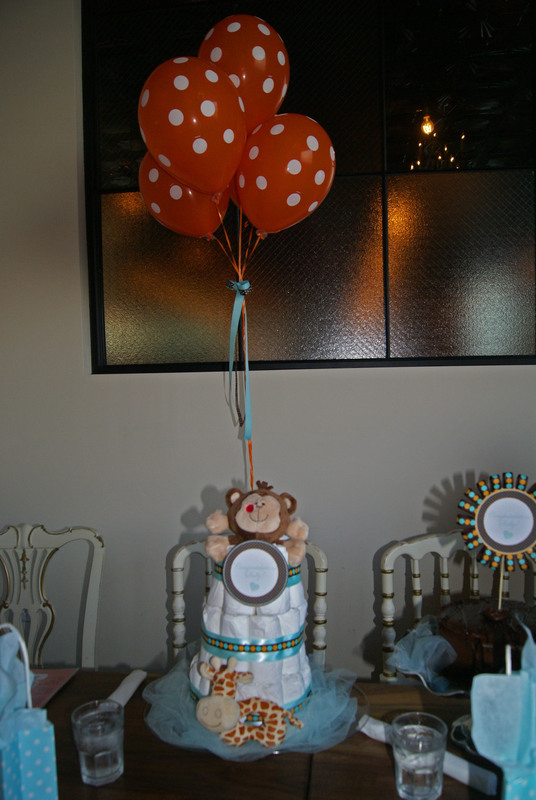 The color scheme was aqua, orange, pale mint green and brown, to match the baby’s bedding/nursery. All the above shower printables will be made available in my store in November. 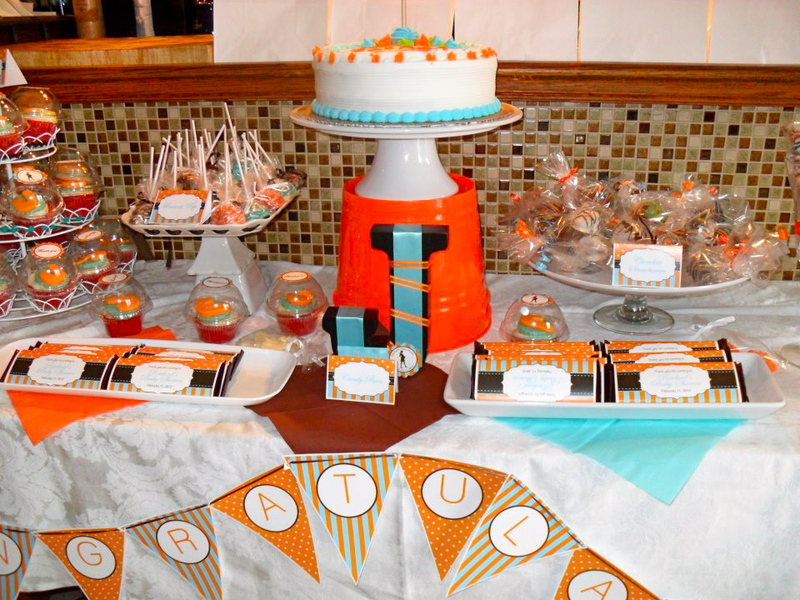 If you have a specific color scheme or look that you’d like for a baby shower, you can contact me at apartystudio@gmail.com Also, check out the other party photos on my Facebook page!